It's time to fire up the barbecue. 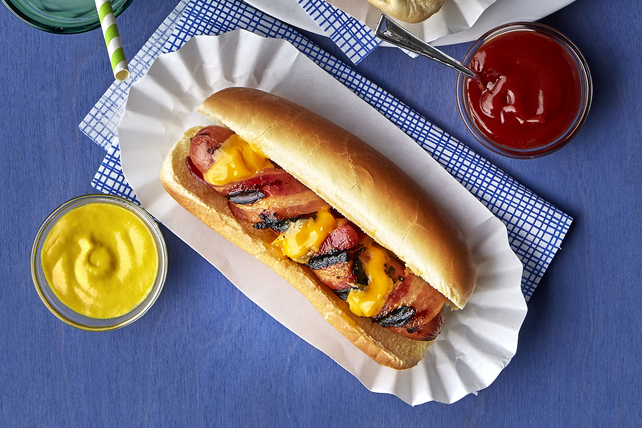 Made with bacon, cheese, mustard and ketchup, these Cheesy Bacon-Wrapped Hot Dogs are a great grilled classic. Heat barbecue to medium heat and heat oven to 400°F. Place bacon in single layer in shallow pan. Bake 5 min. (Bacon will only be partially cooked. Do not cook until crisp.) Remove bacon from pan; drain on paper towels. Cut deep lengthwise slit in each hot dog, stopping 1/2 inch from both ends and being careful to not cut all the way through to bottom of hot dog. Insert 2 Kraft Singles strips into each slit. Wrap 1 bacon slice tightly around each hot dog; secure with wooden toothpicks. Grill 5 to 6 min. or until bacon is crisp and hot dogs are heated through, turning occasionally and adding buns, cut sides down, to the barbecue for the last few minutes to grill until lightly toasted. Remove and discard toothpicks from hot dogs. Place hot dogs in buns; top with ketchup and mustard. Serve with raw vegetables and your favorite fresh fruit to round out the meal.